Why is my AC Broken? If you’ve got the AC broken in your car, it’s probably been a long hot summer. Even if it just recently stopped work, having a car without air conditioning is uncomfortable and annoying. In this article, we’ll talk through the reasons why your AC might be broken so you can get things fixed and keep cool. One of the reasons you might have the AC broken in your car is that the compressor failed. The compressor is the heart of your air conditioning system and if it has failed your system won’t produce cool air. The compressor in your car could have failed simply from normal wear and tear over a lot of miles, or it could be due to debris in your system or insufficient oil in the system. To check for a failed compressor, you can measure the pressure rise across the compressor. If it is lower than normal, then your compressor either has or is failing. In this case, the best thing to do to get your air conditioning working again is to simply replace the compressor. Another problem that can cause your AC to be broken is clogging or fouling in your system. This can come from using low-quality leak stop agents, debris if your system has recently been opened, or even wear products from your compressor. A clog in the system will cause the pressures to change in the incorrect sections of the system reducing the cooling effect. You can check for clogs by checking the pressures around the system and looking for abnormalities. If you find a clogged component, the best thing to do is to replace that component. One of the most misleading causes of broken AC is a problem with your ventilation system. After the blower in your ventilation system, the air is moved through a series of ducts and directed through different passages depending on the temperature setting and vent chosen. If these ducts get clogged or the doors that direct the ventilation air break it can cause the cooled air to be reheated making it feel like your air conditioning is malfunctioning when things are really working just fine. If this is the case, then the feed line to your evaporator will feel cold under your hood but you’ll feel warm air blowing from the vents in your car. If this is the case in your car, you have to replace the damaged components in your ventilation system. There are a myriad of electrical issues that can cause your air conditioning to malfunction. 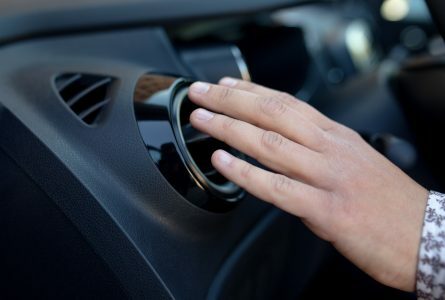 If the compressor isn’t getting the signal from your ventilation system to turn on, your air conditioning won’t cool your vehicle. If the electric fans that cool your condenser are burnt out or have blown a fuse or have a bad relay it will cause your air conditioning system to malfunction at low speeds. If one of the sensors in your air conditioning system fails it can cause your system not to work properly as it is reading incorrectly. If you suspect this is the case, check out our article about electric problems! The most common reason air conditioning systems don’t work is that there is a leak allowing a low refrigerant level. Leaks are common due to the nature of refrigerant used in your system and the operating environment it’s exposed to. You can check for a leak by measuring the low side pressure in your air conditioning system. If it’s lower than normal, you could have a leak causing a low refrigerant level. The best thing to do in this case is add refrigerant to get your system working properly again. Along with your new refrigerant, add Red Angel A/C Stop Leak to seal the leak that got you here in the first place, so you won’t be sweating again anytime soon! Good post. Servicing car ac requires experience. The car ac is connected with the machines and spares of the car so one has to have good experience. I work in a center which provides Car ac service in Chennai and blog posts like these are very helpful for us to gain knowledge and experience.